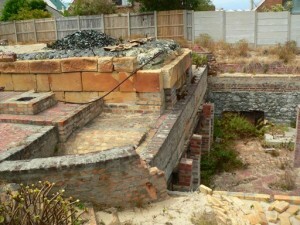 Some years ago I was walking in the area of Elsies Peak in Fish Hoek. I had not been living here long but had already been to the summit so I decided to explore the other side of the hill. My journey took me down the hill towards the spa but being a bit of an explorer I didn’t take the obvious route and ended up cutting through a small opening between some houses. So it was by complete luck that I first happened upon one of the more unusual historical sites in the area- The Cape Glass Company, or rather, what is left of it! It is unfortunate that you cannot explore this site, however, if you are tall enough you can pretty much see all there is to see from the outside of the fence. The Cape Glass Company was registered as a British company on 4th March 1902 under the management of a Mr. Briarley. It was the intention of the company to produce over 8 million dark brown or aqua coloured bottles per annum. That sounds a lot, but then, like now, Cape Town had a thriving brewing industry, both wine and beer. They were going to achieve such high production numbers by using automated processors. In this regard the founders were to be a technical pioneer, this being the first glass works in the world to make bottles using automation only. 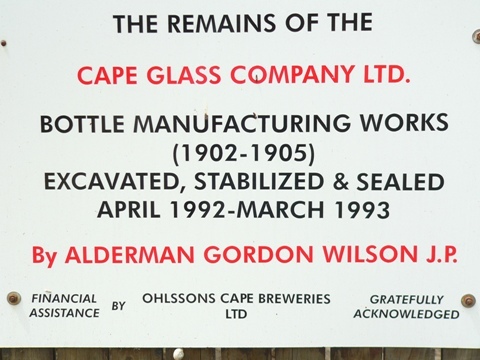 Ohlsson’s Cape Breweries had a large shareholding in the business and saw the glass works as an answer to their need for bottles for their larger production in Johannesburg (importing the bottles was seen as very expensive). The glass works had no competitors, a large market, cutting edge technology and adequate financial backing; so why is the Cape Glass Works not a rival for Pilkingtons? Despite all these advantages the company only lasted until 1905, when it went into voluntary liquidation. What went wrong? The first problem was the location. Quite why the site was chosen is clear. In the early 20th century Glencairn was an inhospitable wasteland and transporting glassware to civilization would undoubtedly lead to a lot of breakages. Also, since the machinery was so cutting edge the work force came primarily from overseas. A combination of isolation and homesickness made for an unmotivated work force. For this reason the production facility was poorly run and inefficient, surely impacting on the bottom line. The other major problem is one that is familiar to Metro rail today (and would have been far worse back then), that of shifting sand dunes: one can imagine that as many people were employed to keep the sand at bay as for making bottles. 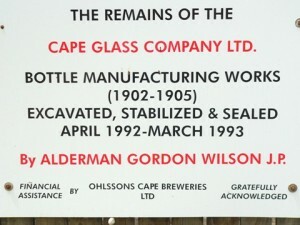 In the end the location and the elements won and the Cape Glass Works was forced to close its doors in 1905. The experiment was never repeated and the site allowed to be swallowed by the sand. The works lay under the sand and was overgrown with vegetation until the 1980’s when extensive excavation revealed the site as it can be seen today. Next time you are at the Glencairn Spar take a minute to walk across, past the Masonic hall and down a break between the houses and there it is, an almost forgot piece of the Cape Point Peninsulas industrial past, and a reminder that we never beat nature we just slow it down for a while.